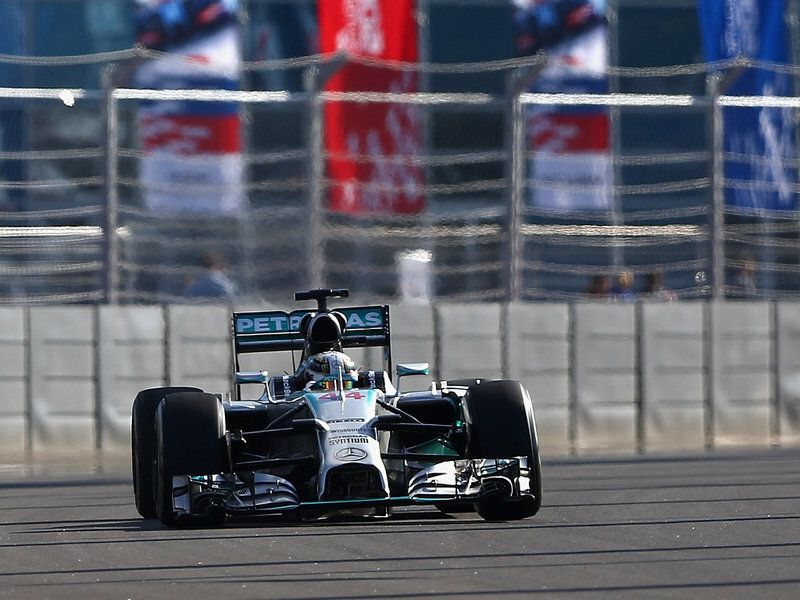 Lewis Hamilton took Pole Position in Sochi after a tight session saw teams close the gap on Mercedes further. The silver arrows can enjoy their eighth front row lock-out of the season however, but only after worn tyres stopped Williams’ Valtteri Bottas taking a sensational pole when he ran wide on the last corner of his last flying lap. Mclaren have been impressive all weekend and this continued into qualifying, but Red Bull struggled for pace. The main story though that will have everyone on the edge of their seats is that the World Championship leaders will head into turn one alongside each other once more. Let’s have a look at how the sessions played out. With Marussia only running Max Chilton this weekend, it meant that only five drivers would drop out of the session. It took a little while, as it did in the practice sessions, for the track to bed in and for cars to get to optimum speed. After early runs on soft tyres, Both Mercedes decided they were safe and spent the rest of the session on the garage. As times settled down; it became apparent that Felipe Massa had an issue, as he was miles off the pace. The team had told him to ‘drive around’ the problem, which must be very easy to say on the pit wall, and very hard to hear in the car. He drove hard and got the gap down, slowly climbing from 21st to 19th and then to 17th; but it wasn’t enough. Even Caterham’s Marcus Ericsson managed to go faster than him and we had a Williams out in Q1, along with both Caterhams, Max Chilton’s Marussia and Pastor Maldonado who is severely lacking track time, and has a penalty to accumulate. I was expecting two runs in Q3, but it was only one long run that most went for. Raikkonen went fastest before Hamilton took top spot. He in turn was outdone by Rosberg – by over a second. Was pressure getting to Hamilton or did he just make a simple mistake? Rosberg stayed top, whilst Button and Alonso went faster than Lewis. He responded by putting in a flyer the following lap, and took pole away from Rosberg still with a few minutes remaining. Ricciardo decided to pit after radioing that his rear tyres were gone and went out for a second run. Hamilton then bettered his time by a further tenth of a second, and Rosberg had to settle for second. But unbeknown to them, Valtteri Bottas had gone faster than anyone in the first two sectors and was a tenth up going into the final few corners. A minor rear end step out was quickly corrected; but on the final corner the car slid out and for all of Valtteri’s opposite lock, he had to settle for third place. A heart-stopping final lap where any one of three drivers could have taken pole. It’s been a while since we saw that! Mclaren kept up their impressive pace, Daniil Kvyat was outstanding at his home Grand Prix, as was JEV, to take tenth. Ferrari seem to still be struggling for pace, but it was good to see them both in Q3. Here’s the top ten, as it finished, bearing in mind that Kevin Magnussen has a five-place grid penalty. Friday’s practice sessions were both dominated by Jules Bianchi, all drivers still very raw from the accident that happened last weekend. Changes are afoot though, talk from the FIA of forcing cars to go on the pit lane limiter through double waved yellow flags, also seems to be the most viable and popular way of ensuring cars are doing safe speeds when they should be. Expect to hear more of this ‘Virtual Safety Car’ Meanwhile, as a mark of support to Jules and his family, Marussia confirmed that after entering reserve driver Alexander Rossi for this weekend that they would only run the one car of Max Chilton; with Bianchi’s car being prepared, but left on stand in the garage, with Bianchi’s name still on the car. FP1 had a slow start as drivers took their time to bed the circuit in. This was after all the first time these drivers had physically taken their F1 cars around the Olympic Park circuit. Nico Rosberg set an early pace, a lap of 1.49 which was soon beaten by Button. Mclaren ended up being the surprise package of Friday, their pace looked good and was only bettered in real terms by the works Mercedes team. Despite Jenson Button spinning on the exit of turn eight, he finished FP1 3rd and Kevin Magnussen in the other Mclaren finished 5th. By midway through the session, Mercedes had asserted themselves as the top one-two, but it wasn’t simple for them. Hamilton complained on the radio questioning vibration in the car, as his team mate saw various late braking sent him over kerbs and off the track. A ‘creative’ setup that didn’t really work; but kudos to Nico – he has to try something to get back at Lewis this weekend. Further down the field it was mainly steady going for the midfield and back runners, as solidarity in practice could teach some teams something that gives them the jump over the rest of the tight midfield. Sauber decided to put Russian driver Sergey Sorotkin in Esteban Gutierrez’s car and Merhi took Kobayashi’s Caterham; who made a very bizarre decision to wait until the track had rubbered in to get some serious running going. To some, it looks as though they’re making savings financially by cutting time on the track. But if you cut time on the track during practices – you are going to be at a massive disadvantage for the rest of the weekend. It’s a defeatist attitude in a sport where you should never give up. Is this the beginning of the end for the Norfolk based Caterham team? FP2 started much as FP1 had finished, Romain Grosjean complaining about the setup of his Lotus, after hearing him state that he had no power in FP1. A small battle was waged for the top time with both Mclarens and Nico Rosberg swapping lap after lap as the cars got faster, the track gained grip and the drivers drew more confidence from their machines. This carried on for a little while before Lewis Hamilton became the first driver to put in a lap under 1.40sec. An absolute stunner of a lap that left him almost a second clear of the chasing pack. Daniil Kvyat at his home race had made the call to pit after problems with his car. it proved to be the right decision as he went out, and went fast, taking fourth position. His predecessor at Red Bull, Sebastian Vettel, was also on the radio telling his long-serving engineer ‘Rocky’ that he had no speed on the straights. Rocky discarded this as a headwind, much to Vettel’s chagrin. Perhaps that relationship has gone a bit cold since Vettel announced his departure? Ricciardo in the other Red Bull had a slow but steady session before he stopped out on track with a few minutes remaining, simply stating “I think she’s gone” which brought out the red flag. Poor Red Bull session in total, both cars finished 9th and 13th. With seconds remaining Nico Rosberg was on a flyer hoping to usurp Lewis Hamilton at the top of the leaderboard, but a mistake toward the end of his lap meant he stayed in fourth place. Saturday’s FP3 again picked up where the last session left off. Hamilton going fastest early on with Rosberg four tenths adrift. All cars went out quite early on, trying to make the most of the one hour session. The only one who waited for a while was the laid-back Danny Ricciardo. Another Red Flag was brought out with 42 minutes remaining, as Kevin Magnussen stopped out on track. Replays showed why; what looked like a suspension failure followed by some excellent steering wheel wrestling by Magnussen prevented his car from going into the wall. Mclaren were less successful in this session, compared to Friday. Jenson Button could only manage thirteenth by the end of the session. Kimi Raikkonen was first to go out on a qualifying simulation, but the Ferrari team didn’t quite seem to have the pace, until Fernando Alonso went fourth by the end of the session. Hamilton set another stunning lap, going 1.4 seconds clear of Rosberg, and then Bottas went second before Hamilton, on another faster lap, spun at the penultimate corner and crossed the track to enter the pit lane. Rosberg managed to go faster than Bottas, but had to settle for second again, behind Hamilton.